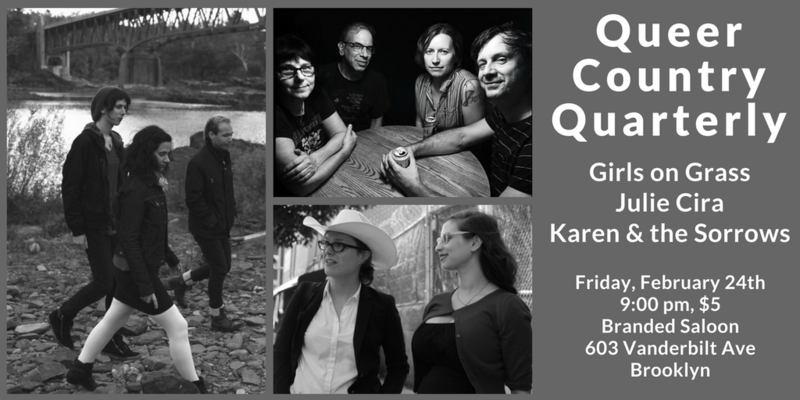 Friends, this Winter QCQ is all about the hard-rockin’, guitar-slingin’ tough femmes of queer country. Barbara Endes’ Girls on Grass is perfect badass twang and jangle. And Julie Cira, coming to us from Northampton, MA, brings the dark, gritty siren songs you need. Plus, the Sorrows have been working hard in the studio, getting our second album ready, and we’ve missed playing you our songs about everything falling apart! So come soak up some queer country love and community, eat free candy and drink a little too much, howl along with the pedal steel, and get what you need to get ready for another day of resistance. This entry was posted in Queer Country Monthly and tagged #queercountry. Bookmark the permalink.